The seasonal timing of peak streamflow has shifted, driven by warming temperatures. Over the last several decades in Canada, spring peak streamflow following snowmelt has occurred earlier, with higher winter and early spring flows (high confidence1). In some areas, reduced summer flows have been observed (medium confidence). These seasonal changes are projected to continue, with corresponding shifts from more snowmelt-dominated regimes toward rainfall-dominated regimes (high confidence). There have been no consistent trends in annual streamflow amounts across Canada as a whole. In the future, annual flows are projected to increase in most northern basins but decrease in southern interior continental regions (medium confidence). Streamflow-related floods result from many factors, and in Canada these mainly include excess precipitation, snowmelt, ice jams, rain-on-snow, or a combination of these factors. There have been no spatially consistent trends in these flood-causing factors or in flooding events across the country as a whole. Projected increases in extreme precipitation are expected to increase the potential for future urban flooding (high confidence). Projected higher temperatures will result in a shift toward earlier floods associated with spring snowmelt, ice jams, and rain-on-snow events (medium confidence). It is uncertain how projected higher temperatures and reductions in snow cover will combine to affect the frequency and magnitude of future snowmelt-related flooding. In regions of Canada where there are sufficient data, there is no indication of long-term changes to lake and wetland levels. Future levels may decline in southern Canada, where increased evaporation may exceed increased precipitation (low confidence). 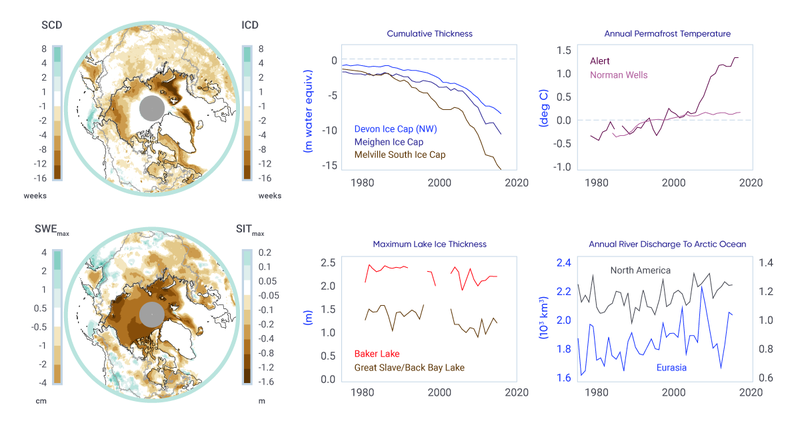 Projected warming and thawing permafrost has the potential to cause future changes, including rapid drainage, in many northern Canadian lakes (medium confidence). Periodic droughts have occurred across much of Canada, but no long-term changes are evident. Future droughts and soil moisture deficits are projected to be more frequent and intense across the southern Canadian Prairies and interior British Columbia during summer, and to be more prominent at the end of the century under a high emission scenario (medium confidence). The complexity of groundwater systems and a lack of information make it difficult to assess whether groundwater levels have changed since records began. It is expected that projected changes to temperature and precipitation will influence future groundwater levels; however, the magnitude and even direction of change is not clear. Spring recharge of groundwater aquifers over most of the country is anticipated to occur earlier in the future, as a result of earlier snowmelt (medium confidence). Freshwater availability in Canada is influenced by a multitude of factors: some natural, some as a result of human activity. Changes in precipitation and temperature have a strong influence, both directly and indirectly, through changes to snow, ice, and permafrost. Disturbances of the water cycle by humans (dams, diversions, and withdrawals) make it difficult to discern climate-related changes. Direct measurements of freshwater availability indicators are inconsistent across the country and, in some cases, too sparse to evaluate past changes. In addition, future changes are determined from a multitude of hydrological models, using output from numerous climate models with different emission scenarios. These factors make it challenging to conduct a pan-Canadian assessment of freshwater availability, and even more difficult to determine whether past changes can be attributed to anthropogenic climate change. In this chapter, national and regional studies are considered, along with information on changes in temperature and precipitation from Chapter 4 and changes to the cryosphere from Chapter 5, to assess changes to freshwater availability in Canada. Past changes in the seasonality of streamflow have been characterized by earlier spring freshets (the increased flow resulting from snow and ice melt in the spring) due to earlier peaks in spring snowmelt, higher winter and early spring flows, and, for many regions, reduced summer flows. These changes are consistent with observed warming and related changes to snow and ice. During the last 30 to 100 years, annual streamflow magnitudes, surface water levels, soil moisture content and droughts, and shallow groundwater aquifers have, for the most part, been variable, with no clear increasing or decreasing trends. This variability corresponds to observed year-to-year and multi-year variations in precipitation, which are partly influenced by naturally occurring large-scale climate variability (see Chapter 2, Box 2.5). However, for many indicators, there is a lack of evidence (particularly in northern regions of the country) to assess Canada-wide past changes in freshwater availability. Continued warming and associated reductions in snow cover, shrinking mountain glaciers, and accelerated permafrost thaw are expected to continue to drive changes in the seasonality of streamflow. This includes increased winter flows, even earlier spring freshets, and reduced summer flows, as well as corresponding shifts from more snowmelt-dominated regimes toward rainfall-dominated regimes. Annual streamflow is projected to increase in some areas (mainly northern regions), but decline in others (southern interior regions). Thawing permafrost could cause future changes in many northern Canadian lakes, including rapid drainage. The frequency and intensity of future streamflow-driven flooding are uncertain, because of the complexity of factors involved. Projected increases in extreme precipitation are expected to increase the potential for future urban flooding. However, it is uncertain how projected higher temperatures and reductions in snow cover will combine to affect the frequency and magnitude of future snowmelt-related flooding. Lower surface water levels of lakes and wetlands are expected, especially toward the end of this century, under higher emission scenarios (see Chapter 3, Section 3.2), due to higher temperatures and increased evaporation. However, the magnitude of these decreases will depend on how much future precipitation increases offset increased evaporation. Future increases in drought and decreases in surface soil moisture are anticipated during summer in the southern Canadian prairies and interior British Columbia, where moisture deficits from increased evapotranspiration are projected to be greater than precipitation increases. These changes are expected to be more prominent toward the end of this century under higher emission scenarios; however, there is considerable uncertainty in their magnitude. Groundwater systems are complex, and, although it is expected that changes to temperature and precipitation will influence future levels, the magnitude and even direction of change is not clear. However, in the future, spring recharge of groundwater aquifers over most of the country is anticipated to occur earlier, as a result of earlier snowmelt. These anticipated changes from anthropogenic climate warming will directly affect the timing and amount of future freshwater supplies, and they may be exacerbated by human management alterations to freshwater systems. The impacts are expected to be more prominent toward the end of this century under higher emission scenarios, given the larger associated climate changes. Of particular concern are impacts in regions that currently rely on snow and ice melt as freshwater sources, as well as continental interior areas, where increased evapotranspiration from warmer temperatures could reduce future water supplies. However, freshwater supplies in all regions of Canada are expected to be affected in one way or another. It is also anticipated that water-related extremes, such as droughts and floods, will intensify these impacts.